Laughing Pig is powering through the remainder of our 18-19 season with the speed and determination of a pedicab driver who’s short on rent. Tonight we open our third Monologue Cafe, where writers submitted themed monologues to be performed by talented local artists. This time it’s all about those classic tales of shame and absurdity we call #FML. •What is your background with writing? I started writing in high school nobody told me to stop throughout high school and now so if you don’t like my monologue that’s on them. I’ve had a quite a few of my plays performed in Phoenix but it’s been a hot minute. • How did the FML theme inspire you? Well it made me think back on some rather unfortunate times, mostly hilarious in retrospect but at the time were not. I went with one that felt pretty funny at the time too. •Why is it important to share our less–flattering moments? Our embarassments are ways we can sometimes feel out of control or even lower than others. If you own them, it becomes like an armor. I think thats a Game of Thrones quote. •Was there another story you considered sharing, but held back on? Theres a lot, most of them booze related. There was one time I got lost in the woods and another time I woke up with a stop sign. There’s also a lot of non booze stories but not as funny. •What are you expecting from the performance? I’m hoping the audience properly laughs at my dumbness. • What is your background with acting? I was involved in theater in high school, but in the nine years since, I haven’t done any acting until now. • What was your reaction to the piece you received? When I first saw my piece I found it difficult to relate to, as I myself am not prone to blackout drunk moments. But then as I read into it, I realized that the monologue is also about the awkward situations this guy got into and the effort he was willing to put forward to avoid catastrophic embarrassment. And I think we can all see ourselves in that. •Why is it important to share our less-flattering moments? I think sharing embarrassing or shameful moments helps others get through tough times, and that’s always good. That being said, there are a few stories that are better kept to ourselves. • Did this experience remind you of any of your own experiences? At my drunkest, I too have made coworkers uncomfortable, destroyed property, and urinated in plain view of innocent bystanders. The difference between these stories and my monologue are that they are among my best memories! Ideally, I will be scouted at this performance to play Aegon Targaryen in the new Game of Thrones spinoff series. In the unlikely event that doesn’t happen, I have no backup plan. I’m a published poet and fiction writer and have been writing since I can remember myself, although I began writing in Russian (my first language). I discovered playwriting in 2017 and am completely head over hills with this medium. I have been living and breathing plays since. It’s a brilliant display of character isn’t it, to see them deal with embarrassment. It tells so much in so little time. Because we need to be reminded that we are all only human. We’re not alone in this. Yes, but it was too long. I’m hoping it is a slow and steady burn, and I hope that by the end, it hits you in the stomach, and you connect. I’ve had a love for acting my whole life and started performing in plays at school and summer camp before I was 10. When I was 11, I filled in for a middle aged woman in a completely age-inappropriate community theatre play in which I played the father of a teen hippie played by an 80-year-old woman. It should go without saying that from that moment was born a lifelong love affair so great it would make peanut butter and jelly jealous. It was disheartening to see one woman unravel and pity herself for not being like a woman that she found enviable. It undermines her decisions on how she lives her life and minimizes her feelings on what she finds important. She seems to be more embarrassed by her own lack of self worth in comparison than any actual event. Our less-flattering moments are real and sharing them is what connects us. No one is safe from experiencing them, no matter how glamorous their lives may seem. Those are the moments that make us laugh or cry, they evoke the very thing we want to feel from seeing a movie or play or reading a good book. They are what make us vulnerable and makes the flattering moments so satisfying. And you know, maybe some of us wouldn’t have much to share if we couldn’t share the less-flattering moments but I’m doing my best ok? Well I’m the queen of saying the wrong thing. So. Yes. That’s the exciting part of performing live, you never know what to expect. Most of my life, writing has been technical in nature; job related, manuals, newsletters, and instructional. In recent years, I began writing for myself. Its often a exercise in capturing stories from memories. Other times I draw on situations I find myself in currently that strike me as amusing or even ridiculous. Ridiculous is a great place to find humor. I have found performing my writing at storytelling and spoken word events has been the logical next step for me, one activity feeding off the other. Embarrassment is universal, relatable and links to vulnerability, another great place to mine humor while contemplating the human predicament. While a lot of my writing is driven by a theme or prompt, I usually have a story or scenario already twisting its way out of my head onto the paper. As the Berry Turns monologue was a fragmented story line I was able to bring into focus with the theme embarrassment. If a story is the shortest bridge between two people, sharing a vulnerability is the short-cut to authenticity. I have other pieces that could have fit an embarrassed theme but this one really developed in a way that I could disassociate from enough to see someone else as the central character. Writing this monologue was a sort of breakthrough for me. #1. I hope people are entertained and want to hear the rest of the story, if there is one. Second, I expect to have an awareness that was not available during the writing phase by observing the actor engage in the next phase of the creative process by bringing the monologue to life and the audience response. Well according to my family, I’ve been a drama queen all my life, but #FML is actually my acting debut! I absolutely appreciated the comedy and depth of this piece, and I’m excited to bring it to life. So many life lessons are birthed out of our less-flattering moments in life, and that crazy experience could be a lesson for you or for others. In any event, it’s necessary to celebrate the wins and the not so winning moments. There are definitely some parts of my piece that resonated with experiences in my life. I actually can identify with bits of ALL the monologues which pretty much tells you that I’ve had a couple of “interesting” experiences. You mean besides being discovered and cast in a major motion picture? I just expect to have fun. and hopefully in doing so, I make the playwright proud and the audience laugh while thinking about their own experience in life. Tickets are still available for all four performances! We can’t wait to impress you! Laughing Pig Theatre is looking for new and interesting workshops to bring to the community. Submit your workshop proposal to us today! 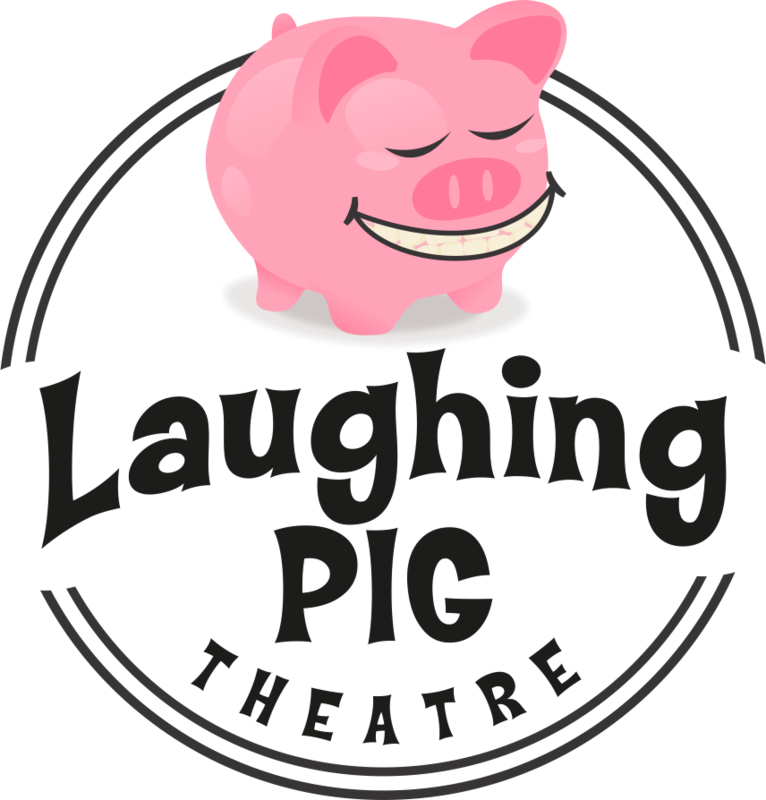 Laughing Pig Theatre will be holding Improv auditions on January 9th at 7:30pm at the Mesa Arts Center’s Acting Studio. We are looking for collaborators with a good attitude. Experience is not required. If cast, you will be apart of LPT’s (Laughing Pig Theatre’s) house team! Our house team will rehearse once a week on Wednesday evenings and perform monthly. Sign up for the audition here. The Acting Studio is located on the 2nd floor of Studios South right above the Ceramic Studios. We will also have signs posted, so look for the signs! Laughing Pig Theatre is seeking WRITERS and STORYTELLERS to write a personal monologue or story about feelings of “embarrassment.” We are seeking diverse storytellers willing to submit personal pieces that illustrate the full range of emotions part and parcel to the experience: humor, tragedy, everything in between. The only guideline is that it must be your original work. Length and exact theme is up to the writer as long as it is inspired by “embarrassment.” The submission deadline is February 2nd at 11:59pm. Our team will select the final pieces that represent the theme. Selected monologues will be performed in our Monologue Cafe on March 22th, 23rd, 29th, & 30th. This event will be public, and video and audio recording is okay. As part of your submission, you give Laughing Pig Theatre the rights to utilize audio, video, and still images from the Monologue Cafe for professional purposes. You will retain all rights to your work. For future reproductions by Laughing Pig Theatre we will request your permission. Should we select your piece, you will get a digital copy of the performance and a performance as a thank you. You are also welcome to perform your own piece but because of the sensitive nature of what we are asking, we do not require that you read your own work. We will have performers standing by to bring your words to life. If you choose to perform your monologue, you must be available and memorized on March 18th- 21st (7:30pm-10pm) for dress rehearsals and performances March 22nd, 23rd, 29th, & 30th (6:30pm-10pm). Please contact us at laughing.pig.theatre@gmail.com with questions. Thank you so much! We look forward to reading your story! We are always looking to work with new people, and there are so many opportunities at Laughing Pig Theatre. If you are interested in getting involved in anyway, we would love if you filled out this form! We’re back with the second half of our ensemble, four performers directed by Artistic Director Taylor Moschetti, tackling six shows: The Role of the Actor, Frost/Macbeth, The Petition, Pray for Us! They Sent Jim Cantore, The Ills We Do, and Hamlet’s Revenge! •What is your performance background? Been acting since I could walk. graduated with a BFA from the University of Montana. Studied at The Groundlings and A Noise Within. Will perform any change I get! •What is your favorite Shakespeare play? •Which of your characters do you most relate to? I enjoy the bailiff’s relationship with the Doge. I love playing a sidekick. I imagine myself at the little king from Alice in Wonderland or the little laughing creature next to Jabba The Hut. •Which do you prefer: Comedy or Tragedy? •What is a favorite quote from one of the shows? •Completely unrelated: What is your favorite kind of pie? My mom’s sugar pie. It’s so effff……efffffffffffff….. darn delicious. Also pumpkin and chocolate. •What is one thing people should know about you? I love Harrison Ford. Probably too much. I’ve been training for the past 3 years. I started with Meisner training. The studio I train with now teaches Method acting. I learned acting in grade and middle school, and decided to return a few years ago. Probably the Doge. I relate to his arrogance and laziness. When it comes to classical plays, tragedies. Pizza (yes, it’s a pie). Both, I love Shakespeare and so I’ve come to appreciate a good Comedy and a good Tragedy because of him. My performance background is entirely with Laughing Pig Theatre, and I’ve loved every moment. My favorite Shakespeare play is King Lear. Love that bit with the mirror or feather at the end. Just cracks me up. I relate most to the character of The Actor. He wants to be taken seriously but doesn’t take himself seriously enough for the respect he wants. I prefer Tragedy over comedy generally, but man, I like goofing off so much. My favorite quote is probably, The Actor tring to figure out somebody who may have payed Hamlet. He falls pretty flat on his face, it’s great. Mud pie! Always and forever will be my kind of pie. Something people should know about me: yes, I really am that pretentious all of the time. Don’t forget you can only see these fantastic shows December 7, 8, and 9, so get your tickets today! The first Shake-Smash is right around the corner (if that corner took four days to turn around)! To continue our tradition of spotlighting the fantastic people we work with, we want to profile our whole nine-person ensemble cast for this show! I’ve been performing around the valley for 13 years in both community and youth theatre and I’ve even been recognized by both the AriZoni Awards and the National Youth Arts Awards. My favorite play by dear Bill has got to be Twelfth Night. The character I most relate to in these shows is probably Bill as Romeo. Even though I didn’t drop out of high school and have never been in a student film. When it comes to the question of Comedy or Tragedy, I find Comedies with a hint of tragedy, it Tragedies with comedic moments to really hit the sweet spot. The line that stands out to me the most, is “Routine dulls love’s dagger” in the play Casting Call. My favorite kind of pie is admittedly Peach Cobbler. Something most folks should know about me is that old movies are a way of life. They are the fuel of my inspiration, and the soothing of my soul. I’m a student actor. I had previously only acted in one community play after being in a few high school productions back in my hometown of El Paso, TX before taking a 10-year hiatus from theater to work in retail, then corporate America here in the Valley. After realizing how much I missed it, I was lucky to be cast in a few roles at Mesa Community College and do some properties and set dressing design work, before most recently being cast in my third professional production as Blythe Donnelly in Stray Cat Theater’s upcoming show, “Two Mile Hollow”. I’m sure it’s cliche, but Midsummer Night’s Dream will always hold a special place in my heart. It was the very first play I was cast in (the ONLY 6th grader who landed a speaking part, thank you very much). The mistaken love, fairies, the trickster Puck, a play within a play… It’s just so fun, a great introduction to the worlds of Shakespeare! There is actually a lot of myself in all of the characters I get to play, but if I had to pick one, I probably relate the most to Jan Peterson in “The Shakespeare Project”. She’s friendly, supportive, softspoken, underestimated, and willing to stand up for herself and those she cares about when it’s needed. Oh man, there are so many fun parts to both, but I’m going to have to say comedy. It’s pretty easy to make people feel sad (difficult to make them cry, and that’s SO great when you can do it), but it takes timing, subtly, and skill to make them laugh. There’s no feeling in the world quiet like making an audience laugh. I don’t do drugs, but I imagine it’s like drugs. All of these pieces have so many wonderful nuggets of prose, but my personal favorites are from the little bits of wisdom Grandmother in “Ravenna Rose” shares that I think many of us need to be reminded of, especially in today’s society: “Do not fear age, fear ugliness of heart. What matters? Are you kind as you are fair? For beauty lives with kindness, they’re a pair.” And, “With mirth and laughter, let old wrinkles come…” Age isn’t something to fear if it is filled with a life of joy, and a kind heart is the most beautiful of all. Lemon Meringue is the best pie. No contest. I am often unnecessarily verbose. I got my start in acting with the Laughing Pig Theatre, first taking their acting classes, then participating in performances like the Monologue Café and now, Shake-Smash! My favorite Shakespearian play is definitely Much Ado About Nothing! I still remember reading it in high school and ~finally~ understanding what was being said well enough to laugh at a joke in the text. That moment turned Shakespeare into art that was interesting and relevant, rather than something to gloss over with Spark Notes. I think Ravenna Rose has a really understandable perspective. Our society is so obsessed with beauty and youth, it’s no surprise an impressionable young woman would wish she were forever young! I’m not one for tear-jerkers and comedies at least give me a chance at a happy ending! Of climes, wealth, or elevation. Livestock! That can be roasted, cured, ground or salted! For any occasion! If I’m a fig, she’s beef. Hands down, bourbon banana cream pie. My performance history is pretty slim outside of high school, although I have done a lot of shows while in high school. These include 12th Night, Romeo and Juliet, Wait Until Dark, and The Laramie Project. Favorite Shakespeare play would probably be Macbeth. It’s a dream role of mine. Which is why I’m glad I’m sort of playing him in this production! I relate most to Mac. I am very vulnerable to peer pressure. One thing people should know about me is that i’m much more introverted than my characters make me out it be. I’ve been performing since I was 7. Choir, orchestra, drama, film, standup, you name it, I’ve probably done it. I studied film theory in college, which helped me learn not just how to perform but why we perform. The past three years, I’ve been a stand up comic, and I’m super excited to be back onstage! I LOVE Macbeth. I love works about guilt and crime, messed-up marriages, and just a taste of magic, and Macbeth has it all. Lady Macbeth is probably one of my favorite characters ever in anything, she’s just such a great example of twisted ambition, and what happens when we limit women. I honestly relate most to Mrs Label. I admit, I can be a little “holier-than-thou” when it comes to literature and film, and can get pretty frustrated when I’m surrounded by people who aren’t taking things as seriously as I am. Sometimes it’s hard being a braniac! I think comedy is harder to pull off correctly, but I thing tragedy is much more satisfying. Getting to feel these huge, often dark emotions is so cathartic, and I come off stage after a particularly heavy scene just feeling lighter in life. When I’m not performing, I’m a huge granny who loves to knit! Check out the rest of the cast tomorrow, and come see Shake-Smash this weekend only!